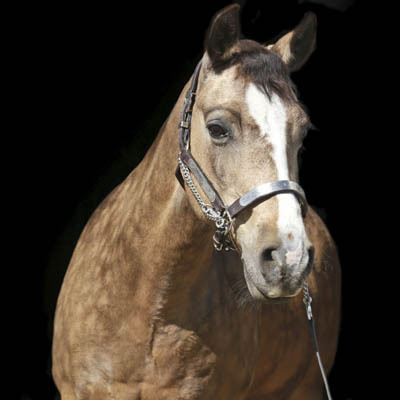 Finale is a Buckskin Welsh Cross mare, and she stands at 14.2HH. Finale was born in 1999. Finale was donated to PARDS by Maryann Isaacson and has been in the PARDS Therapeutic Riding Program since 2010. This little show pony spent many years competing in the show jumping ring at Spruce Meadows before starting life as a therapeutic riding horse. You may see some of our youngest riders taking a lesson on Finale. Clients who experience challenges with expressive language may find that her movement encourages deep breathing, correct posture and trunk, neck and jaw control, all of which are needed for speech.